How many of you have woken up in the morning with a zit aching and burning your skin? Well, according to the mind-boggling statistics the Google provides us today, in India about 66 million people suffer from acne. This means, most of us at some stage of our life have suffered through acne. Acne is not encountered by all of us as the same. Some might have a mild case of acne like maybe blackheads, whiteheads ( who doesn’t know these?) or for some it might escalate to a degree where it is placed in the hall of fame with other chronic and painful diseases (where you might end up taking pills). Today, in this article I wish to address the simple issues related to acne like causes, effects, types and so on and so forth. And I wish to make this reading experience all the more informative and interesting so I might squeeze in a few pictures which will be (obviously) copied straight from the internet. Yeah, I am guilty for that. What is the reason for acne? Unclean hygiene? Curses from the gods? Yeah, ok I am pushing my luck. But the basic scientific fact behind acne is that our skin has innumerable number of pores which allow the skin to breathe. These pores on the skin are connected via a canal to the oil glands which release an oily substance called sebum. This sebum when sometimes gets entrapped with a hair follicle or dirt gives rise to the ugly looking red thing. So, clearly people with oily skin are more prone to acne. As teenagers their due to the various cocktail of hormones running haywire in their blood, secretion of oil is more, sebaceous glands (oil glands) more active due to the androgens (responsible for our puberty). Firstly, let’s encounter the types of acne to let you know exactly what exactly the state of your acne is. Whether it is mild, moderate or severe. Here is basic idea for you to refer from. 6.Cysts – clearly visible on the surface of the skin. They are painful, and are filled with pus. Cysts can easily cause scars. HORMONES- As I mentioned earlier, androgens increase sebum, in turn increasing oil , increasing bouts of acne. Often , during pregnancy hormone changes can play an important role in unleashing acne ( tan tada, so much for drama). Also various contraceptive pills also contribute for being one of the factors. MEDICATIONS- Certain medications containing corticosteroids, androgens or lithium can cause breakouts. DIET- certain foods which can be termed to be allergic and often dairy products can cause breakouts but it isn’t still proved and one of the more allusive topics. STRESS- emotional health and the body are said to be connected. Stress acts on immune system, endocrine system, digestive system etc. though stress can cause an increase in inflammation it cannot effectively cause it. As of yet, acne remains to be one of the more mysterious topics whose cause can be attributed to a mixture of all these topics. Science is yet to explain many of its reasons but there also have been various success stories too. Yes children, your parents are right, do not believe everything the internet says. Often it can give out utter bogus information and here I am to inform you of the utter absurdity internet seems to sell us. Often information access is true too but be careful while filtering your information and always consult a specialist. Intense scrubbing cleans acne.bleh. Cleaning your face is neccacary true, but do not intensely scrub your face it destroys the normal texture of your skin and strips it of oils. People with acne are unhygienic. Often, they take care of their skin more. Only teenagers get acne. Uh huh, adult acne is often more severe. Acne goes away on its own. That might be the case in many conditions but often severe acne requires treatment. Acne can’t be cured. It can be cured by proper medication but there is no hundred per cent guarantee. People with acne prone oily skin shouldn’t moisturise. Wrong. Robbing off the skin of its essential oils will cause the skin to overcompensate and it will release more sebum hence, more acne. Often people opt for antibiotics and pills which have large number of side effects because it messes with natural hormonal counterbalance of the body. Hormones are often required in small amounts any change in their delicate balance can have far reaching defects in terms or structural abnormalities or even conception during pregnancy. For mild to moderate acne often simple life style changes can help. Exercising regularly, keeping a healthy diet and trying to maintain normal hormonal balance. Sometimes using certain over the counter medicines or home remedies can help in effectively treating mild to moderate cases of acne. But, for severe cases and with lesser side effects various homeopathic medicines do the work. Many homeopathic medicines include- kali brom, mag mur, silicea, pulsatilla are indicated according to what the patient presents. 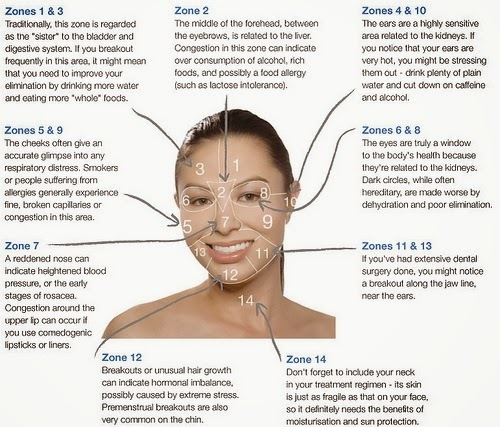 Acne face map is a tried and tested way of naturally curing acne. Notice where you might have the maximum inflammation and this will tell you what might be the reason for your acne. DISCLAMER though, this won’t work for severe acne cases.